Entries from Digital Intelligence tagged with "verizon"
Verizon Media has launched a new VR 360º video experience, offering users the opportunity to virtually explore some of the biggest tourist attractions in Abu Dhabi. Verizon plans to merge Yahoo and AOL under one brand named "Oath", but the two internet giants will be able to keep their names, according to a news report. Yahoo sale to Verizon "delayed due to security breaches"
Yahoo's $4.8bn (£3.8bn) deal to sell its core business to telco Verizon is now not expected to be completed until the second quarter of 2017, following the revelation of two major security breaches last year. Yahoo is undergoing a major reshuffle as Verizon takes over the embattled web giant. Yahoo is preparing for a third round of bids for the company, as the embattled web giant sees its losses widen to $440m. US communications giant Verizon is considering a bid for Yahoo, its CEO has revealed. In one of the biggest tech deals in 2015 so far, Verizon has bought AOL for $4.4bn (£2.8bn), marking the US telecoms giant’s entry into the competitive online video market. Vodafone has sold its 45% stake in Verizon Wireless to US telecoms group Verizon Communications, as the mobile network operator refocuses on faster mobile broadband services in a new ‘Project Spring’ initiative. Who's winning the press release war online? Microsoft, Facebook and Verizon were the top three most referenced technology brands in February, in terms of popular press releases, according to new research. UK news release distribution company PRFilter has today launched its first monthly PRFilter Technology PR Rankings. The Rankings analyse the technology brands, topics and products that are mentioned the most in the tens of thousands of press releases from multiple aggregated sources that PRFilter indexes each month. 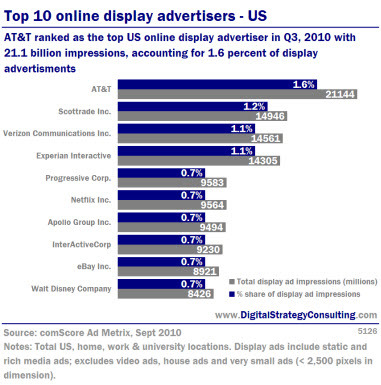 AT&T ranked as the top online display advertiser in Q3, 2010 with 21.1 billion impressions, accounting for 1.6% of display advertisments. Nearly 1.3 trillion display ads were delivered to U.S. Internet users during the third quarter, up 22% on last year, according to new data. 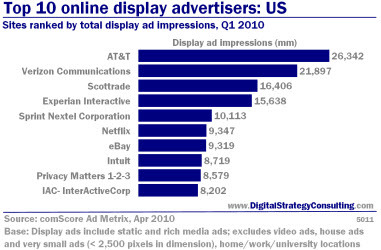 comScore’s overview of the U.S. online display advertising market for Q3 2010, which showed strong gains following softness for much of 2009. “The U.S. online display advertising market exhibited considerable strength in the third quarter with nearly 1.3 trillion ad impressions delivered,” said Jeff Hackett, comScore senior vice president. “Just one year ago we were still in the midst of an advertising recession, but several growth drivers have contributed to sustained improvements over the past few quarters." Google is working on a tablet computer to rival Apple's iPad, according to press reports. The Wall Street Journal reports that the web giant is collaborating with Verizon wireless, the largest US wireless carrier. Verizon Wireless chief executive Lowell McAdam told the Wall Street Journal that tablet computers are part of the "next big wave of opportunities." He told the paper that the tablet computer project is part of a deepening relationship between Verizon and Google, whose Android operating system is used by a number of mobile handset makers.